“The price tag of tuition is rising and so too are parents’ savings goals." 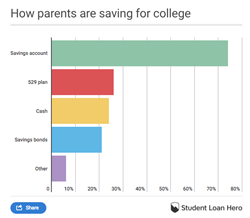 44% of parents who are currently saving for family college costs reported feeling guilty that they haven’t stashed away more to date, according to a new survey from Student Loan Hero. In fact, more than 57% of parents polled said they’d saved less than $10,000. What’s more, 24% of parents reported owing $20,000 or less on their own student debt. But 45% of respondents said they hoped to save more than $30,000 by the time their child stepped on campus. Also, one in five parents said they aimed to stow away $50,000-plus for future college costs. Nearly three out of four parents are are putting their college savings into a bank account, according to the survey. Only 26% are using a 529 plan, while 24% of parents are saving for their child’s education in cash. More than half of parents surveyed said they’d be relying on federal student loans to help their child pay for college. 16% of parents plan to pay for at least part of their child’s education with a credit card. 29% of parents plan to use a personal loan to pay for college. 32% of parents said they planned to take out a Parent PLUS Loan from the federal government. 43% of parents said their moms and dads didn't help pay for their college expenses back in the day. 39% of parents surveyed said their child doesn't fully understand how much college costs and how much they’ll be expected to pay. One out of 10 parents currently saving for their child's education say they don't think the investment will be worth it, or they’re not sure if it will. 43% of parents say they prioritize investing in their 401(k) over saving for family college costs. 37% of parents said they have considered using retirement savings on college costs. The survey was conducted via SurveyMonkey on behalf of Student Loan Hero on Jan. 23-24, 2018, with a nationally representative sample of 1,035 adults living in the United States. “Are you currently saving for your child's education?” was used as a screening question (with a target answer of “yes”). Student Loan Hero combines easy-to-use tools with financial education to help the millions of Americans living with student loan debt manage and pay off their loans. Student Loan Hero has helped more than 150,000 borrowers manage and eliminate over $3 billion in student loan debt since 2012 and assists over 3.5 million people in becoming more financially healthy every year. Student Loan Hero offers both current and former students free loan calculators as well as unbiased, personalized advice and repayment plans through an easy-to-use online dashboard. Founded in 2012 by CEO Andrew Josuweit, who himself had over $100,000 in student loans, Student Loan Hero operates on the belief that all loan help and recommendations should come with honesty and no hidden agenda. For more information, visit studentloanhero.com.